The fourth renourishment of the Panama City Beaches underwent construction during April and May 2017. This is a very important project for maintaining the health of our beaches! The link below will provide many of the details of the project. Q: Where did this project taking place? The interim renourishment project took place along four segments of beach spanning from the west to east ends and totaling approximately 3.5 miles. The approximate half mile “Pinnacle Port” segment placed sand from just west of Pinnacle Port and into, but not including all of, Carillon Beach to the east. The approximate one-mile “City Pier” segment placed sand from and including the city pier beach west to the Palazzo condos. The approximate one-mile “County Pier” segment placed sand from and including the west side of the county pier west to the Casa Loma. The approximate one-mile “Treasure Island” segment placed sand from and including Moonspinner condos west to approximately just east of Gulf Drive/Hurt Street. Q: How much sand was placed as part of this project? How does this compare to the 1998/1999, 2005/2006, and 2011 projects? A total of approximately 840,000 cubic yards of sand was placed within the 4 project areas, although the contract allows for an additional 25% (within the four areas) if deemed necessary at the time of construction. 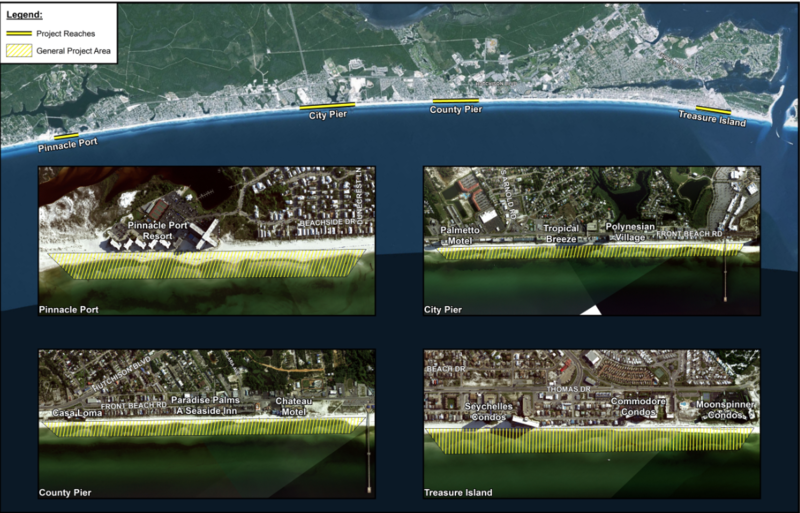 The initial restoration of the Panama City Beaches in 1998-1999 placed approximately 9.8 million cubic yards of sand along the 18.5 miles of beaches. The 2005-2006 project placed approximately 3.3 million cubic yards of sand along 17.5 miles of beaches, and it was conducted in response to 2004’s Hurricane Ivan. The 2011 project placed approximately 1.3 million cubic yards of sand along a total of 7.5 miles of the beaches (east and west ends) and was referred to as a “repair” project as it was conducted in response to several storms following Hurricane Ivan. That project also formally incorporated and provided a project at Pinnacle Port and Carillon Beach. The latest project is a little smaller than the 2011 project and was called an “interim” project as it does not encompass the entire shoreline like the first two projects. However, it was deemed necessary due to the eroded condition of the four segments and should increase the longevity of the entire 18.5 mile project area, thus delaying the need for the next full renourishment. Q: How much did the project cost? And who paid for it? The construction cost for the repair project was approved up to $17.8 million although the base bid was $14.1 million, and it was entirely locally-funded. The local cost-share is provided by the “Third Cent” Bed Tax, an additional one cent bed tax that began being collected in 1997. This beach renourishment fund had ample dollars available for this project. In addition, the Bay County TDC applied for $4.5 million in State of Florida Beach Management Funding Assistance Program funding. Q: Who is managed this project? The Bay County TDC, on behalf of Bay County, managed construction of this project. CB&I, formally known as Coastal Planning and Engineering, Inc., the coastal engineering firm that Bay County/the Bay County TDC was retained for coastal engineering services since the mid-1990’s is the engineer of record for the project and will be leading the construction management in conjunction with the Bay County TDC. Q: Who was the dredging contractor? Weeks Marine was the dredging contractor. They also constructed the 2005-2006 beach nourishment project, which was managed and partially federally-funded by the US Army Corps of Engineers. Q: Where did the sand coming from that was placed on the beach? The sand for large-scale beach nourishment projects such as this come from our permitted, offshore “borrow areas.” The main borrow area is located approximately 3.5 miles offshore of the Thomas Drive area, with secondary borrow areas near the St. Andrews Bay entrance channel. Q: How does the sand get to the beach? The beaches of Panama City Beach that you see today are actually the result of three previous nourishment projects – one completed in 1998/1999, the second in 2005/2006, and the third in 2011. Hurricane Opal (1995) caused significant erosion of the beaches and left very little dry beach along much of the Panama City Beaches. To combat this erosion, as well as erosion from storms since then, renourishment projects have been undertaken. These projects not only provide recreational beach width for the benefit of residents and visitors, but during storm events, the sand also provides critical protection for structures and infrastructure landward of the beach. Because of the 1998/1999 project, there was very little damage to upland development when Hurricane Ivan struck in 2004. In addition, a healthy beach provides nesting areas for species such as sea turtles and shorebirds. This beach nourishment management program is much like a roadway or other such infrastructure – once it is built, it must be maintained. The work you see ongoing now is a small maintenance project that will help ensure continued use of a sandy beach and storm protection for the upland.